At St Mary’s, we use the highly successful Read Write Inc (RWI) phonics programme to teach our children to read. This programme enables children to quickly and confidently learn letter sounds and apply their phonic knowledge to reading and writing. Makes learning to read focused and fun. Uses colourful and exciting prompts to teach all children to read and write. Gives children storybooks matched to the sounds they are learning in order to develop accuracy, speed and confidence. Is an all-inclusive phonics programme for children in EYFS and KS1. Assessments are used half-termly so that children are grouped by ability. More than 80% of children reach the required standard in the Year 1 phonics screening. Foundation Stage: RWI in Reception is taught as a whole class until the initial sounds have been imbedded. Once the sounds have been taught, assessments will take place to determine groupings. Key Stage One: RWI groups will be set following assessments carried out by the Phonics Coordinator. The sessions will occur daily for 1 hour. Once children can successfully apply their phonic knowledge, lessons will be reduced and replaced with spelling, punctuation and grammar (SPAG). Key Stage Two: Additional phonics support will take the form of intervention groups during the afternoon for those children with the greatest need in Year 3-6. If you wish to support your child at home, guidance on the correct pronunciation of sounds can be found by clicking on the link below. A short video is also available to parents using the link below which will explain what happens during the year 1 phonics check and why it is important. In years 2-6, children follow the RWI Literacy and Language programme. This is a complete literacy programme which meets the needs of the national curriculum in a fun and meaningful way. Enables every child to develop a deep understanding of what they read. Prepares children for writing using a planning, drafting and revising method. Incorporates drama and discussion as a key part of children’s learning. Covers the grammar and punctuation aspects of the new statutory assessments; raising attainment for all children. Children also complete a half termly writing focus which enables them to independently apply the skills that they have learnt in Literacy and Language to their writing. 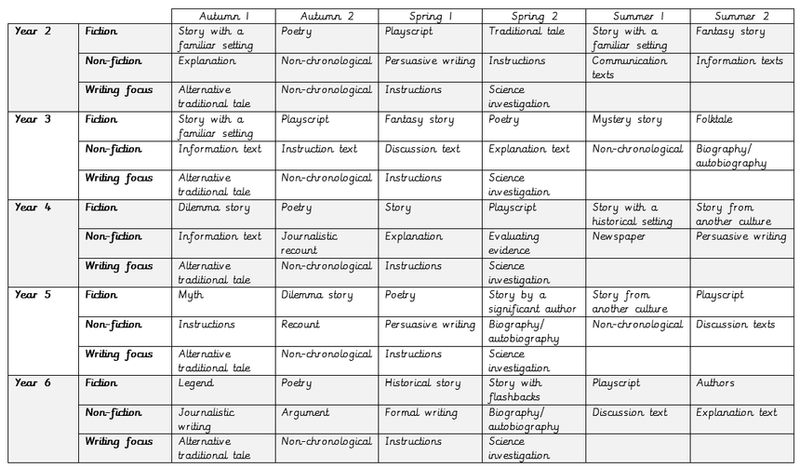 This writing is assessed using national curriculum expectations for each year group. RWI spelling is a 15 minute a day programme used across school to quickly and effectively imbed spelling rules and patterns. To keep children engaged, aliens introduce spelling rules on an exciting online spelling planet and children complete quick-fire activities in their spelling logs. Progress is accurately recorded using practice tests ensuring that children progress quickly. Bug Club is a phonic based reading scheme used throughout EYFS and KS1. Once children have mastered initial letter sounds and are able to blend, a Bug Club book will be sent home linked to the phonics they are working on in class. Your child will be heard at least once a week by an adult in school and books will be changed once a week. We encourage you to read as many times as possible with your child at home, if you have finished reading your school book, please click on the link below where there are a range of eBooks suitable for Reception to Year 6. Once children can confidently read the 44 phonemes, children will move onto Accelerated Reader (year 1 onwards). Accelerated Reader is an assessment based tool used to manage independent reading. Children are assessed and then given a reading level. Children select a book at the lowest point of their reading level and once the book is completed, they carry out an electronic quiz to test their understanding of the story they have read. If children achieve 80% or higher on 3 quizzes, they move up to the next point within their level. If they do not achieve the pass mark, children stay at that same level until they do. Children can carry out as many quizzes as they wish and time will be given every day for children to take a quiz and change their book. If you would like to keep up to date with your child’s progress using Accelerated Reader, please use the link below. Your child’s username and password can be found in their home learning planner.